I heard this week that when someone is lost in the woods, his first inclination is denial. Then he starts to realize he really is lost, and starts to move faster. It’s called “Bush Panic.” Instead of stopping to evaluate his situation (like, where could I sleep tonight, or what will I eat, or how could I contact someone? ), he uses all his energy, often running in circles… until the sun sets and he’s now in a real pickle. So how can we prevent “bush panic”? What can we do when we realize there are honestly more things to do in our days than we have time for? This is good advice if you’re lost in the woods, and it’s good advice if you’re lost in a whirlwind of activity. I’m often too tired at this point to even pray! Often, my husband will take me out, late in the evening (when my little ones are tucked into bed and my oldest teenager can babysit), to a little restaurant where it’s quiet and we can talk. I’ll share my concerns (with animated hands waving and that “wide-eyed” look in my eyes, LOL), and he’ll jot a few things down. (Mostly he just listens.) At the end, I feel a lot better. But “getting things off my chest” doesn’t really solve the problem. My problem is that I’m trying to do 36 hours of work in 24 hours, day after day. I’ll start to worry all over again, probably in the middle of the night, if I don’t come up with some sort of solution. This is where I need to start to pray. “If any of you lacks wisdom, he should ask God, who gives generously to all without finding fault, and it will be given to him” (James 1:5). Next I need to make an honest list of everything I’m involved in and how much time it requires of me. This step might take a few days, because if I rush it, I’ll forget a few things — and then wonder later why I can’t fit everything in again. I have a permanent list always going inumber my journal. Then, if I feel “bush panic” again in a few months, I can go back to my permanent list and evaluate a little quicker, without having to start the brainstorming all over again. Okay, add up all the times listed. There are 24 hours in a day (but only 16 hours after sleep — and yes, I must sleep sometime). There are 168 hours in a week (but only 144 hours if I take a full, 24-hour sabbath each week). Now I can see honestly how bad my problem is. 3. Why did it get this bad? I need to ask some honest questions (and maybe it’s time for a second “date night” with my husband). 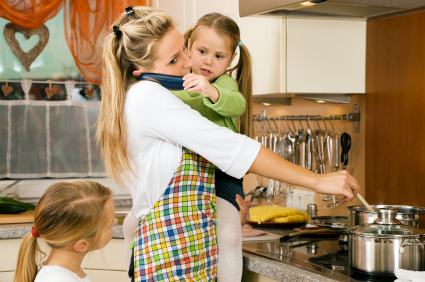 Do I delegate any of the work to my children, or do I try to do everything myself? Am I pregnant or do I have a young baby? If so, this is probably just a “season” (even if it feels like a long season at the moment!). If my baby is old enough, do I need to teach him to sleep so that I can get some rest, too? Is a financial problem causing some of the stress I’m feeling? Am I working the equivalent of 2 or 3 full-time jobs? Is our family involved in too many activities outside the home? Do I have trouble saying “no” without guilt? Do I neglect to ask my husband’s opinion before saying “yes”? Am I distracted by too much television, the telephone, or the computer? 4. How can we fix this mess? for he grants sleep to those he loves” (Psalm 127:1-2). But what about the Proverbs 31 woman? Yes, she woke up early in the morning (see Proverbs 31:15), but I’ve heard some say, because “her candle goeth not out by night” (Proverbs 31:18), that she also stayed up late each night. I suppose it seems like she’d have to, with everything she accomplished in these verses! But as I’ve written in another post, I believe that this verse is saying that the candles she made were of such good quality that they could burn into the night without losing their light. In other words, she was selling candles that didn’t burn out — not burning herself out! What things on your list can wait for another season? What can wait until you’re not on bedrest any longer? What can wait until you’re not nursing a baby in the middle of the night any longer? What can wait until all your children are potty trained? What can wait until you’re no longer teaching Algebra? Is the fate of the entire universe really resting on your shoulders? Read to my children every day, instilling a love for reading in them. Have each child, from age 5 up, write in a picture journal each day. (See samples here.) Dictate to the little ones. The older ones can graduate to notebook paper. Do this every day! Each child should do one lesson from a high-quality arithmetic program every day. The little ones should do phonics daily, and the older ones should study language. So don’t let “bush panic” take over your life! Slow down… hug some little ones… just do what’s important, not just what’s urgent. Believe me… your little ones will soon be getting ready for “driver’s ed” like my “baby” is. As much as possible, enjoy these years of motherhood! “‘Martha, Martha,’ the Master answered, ‘you are worried and upset about many things, but only one thing is needed. Mary has chosen what is better, and it will not be taken away from her'” (Luke 10:41-42). Thanks for stopping by my blog! I'd love to keep in touch. Click here to have coffee with me each Friday. It'll be fun! It's an honor that you took the time to read my blog post. My goal is to always point you to Scripture! How DO you find time to write this post??? Thanks for the good advice! The explanation I like about the Proverbs 31 woman is that the chapter speaks of different “seasons” in HER life. There ARE times when our ‘candle can’t go out at night’, such as when someone is very sick. You know your own case. But we also know we can’t go on that way every night! Also I wonder if the scripture that was niggling your brain is where Jesus told His disciples that there are twelve hours in a day??? (John 11:9) Blessings to you and yours! Hi, my name is Anne. While you’re sipping on a nice cup of something hot, you’ll find lots of help for wives and moms — all about how to find joy in your marriage, parenting, homeschooling, and homemaking. My goal is to always point you to Scripture, so grab your Bible! Is God’s Law for Us Today?